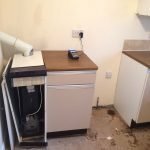 House Clearance Service In Elderslie Sighthill Springboig Springburn Springhill Stobhill Summerston. 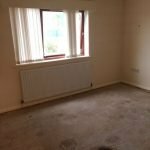 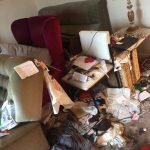 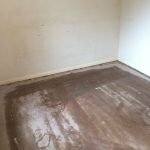 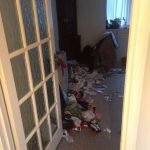 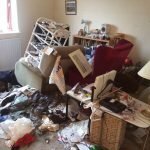 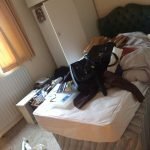 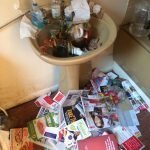 My deceased brother has a 1 bedroom council flat in Elderslie – Glasgow that needs clearing. 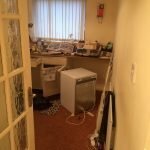 Everything needs to go even the carpets & rugs & curtains. 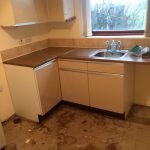 The cooker is gas. 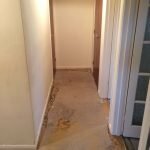 Can you remove this safely without me having to get a gas engineer in to cap it ? 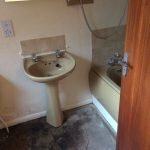 Can someone contact me with a quote & when you would be available. 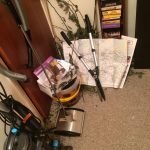 I will be happy to answer any questions you may have. 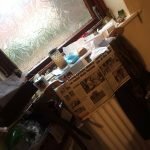 I will be out a lot of the time so email would be preferable. 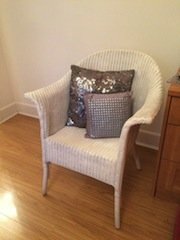 A white painted vintage Lloyed Loom wicker bedroom chair, together with two scatter cushions. 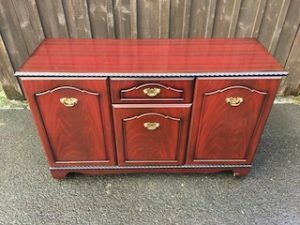 A large stained wood vintage sideboard, having a single cupboard to either side of a central drawer above a smaller cupboard, with brass handles. 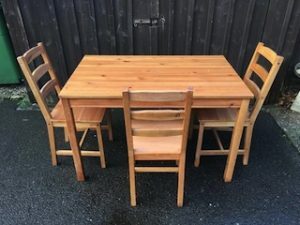 A large farmhouse style solid pine rectangular dining table, together with three matching ladder back dining chairs. 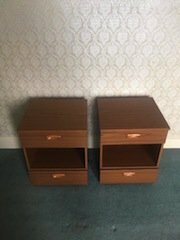 A pair of vintage solid wood bedside units, having one drawer above and below a shelf. 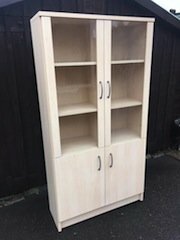 A tall standing beechwood display cabinet, having two glass inlaid doors opening to reveal two shelves. 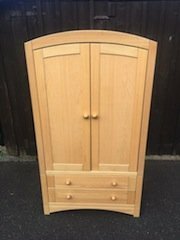 A small solid wood arched top children’s wardrobe, having two storage drawers to the base. 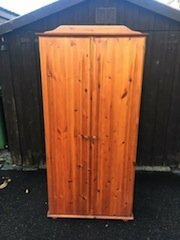 A tall standing solid pine double wardrobe, with shelving space inside. 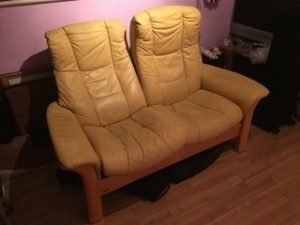 A two seater reclining back sofa on a solid wood base, upholstered in cream authentic Italian leather. 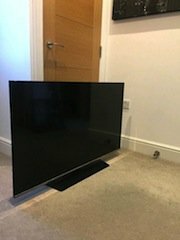 A black 50 inch Panasonic flat screen HD television. 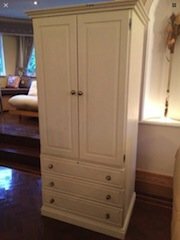 A tall standing white solid wood double wardrobe, having thee storage drawers to the base. 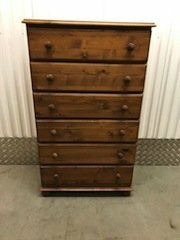 A tall standing solid pine bedroom chest of six drawers. 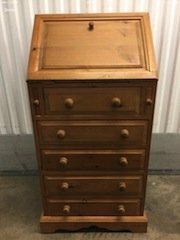 A modern solid pine writing bureau, having a pull down desk above five drawers. 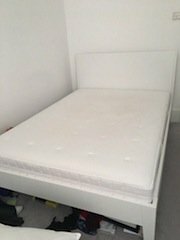 A white Ikea double bed frame, together with a white double mattress. 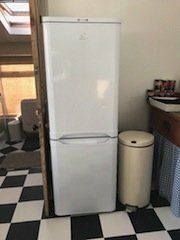 A tall standing white Indesit two door fridge freezer. 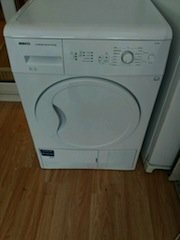 A white Hotpoint 8kg 1200 spin under counter washing machine. 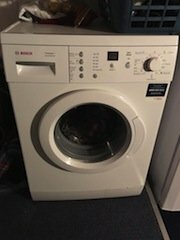 A white Beko 1200 spin 7kg under counter condenser tumble dryer.